Alginate 3D Gel - 1 kg. Alginate (or 3-D Gel) is dried seaweed powder and thus a 100% natural product that is used primarily to copy parts of the body quickly and easily. This product is ideal for making a mold of little hands / feet. 3-D Gel is a 100% natural product that is used primarily to copy parts of the body quickly and easily. The gel is easy to use, cures within minutes and copies the smallest details. The gel is completely harmless to humans and the environment. After use one can simply throw the alginate mould in the trash or on the compost heap. This alginate is chromatic, meaning it will change color when processed. The powder is white and will turn bright pink when mixed. This is the best pouring time, after a while it will start to set and turn to a soft pink. Hold the cast steady from now on till the alginate is white again. The mixing ratio is in weight and not in volume. E.g. mix 100 grams of alginate with 400 grams of water. The 3-D gel can be mixed easily with a mixer until a nice even porridge without lumps is obtained. If you find lumps in the powder we recommend to sieve these out prior to adding water. Mix the required amount of water with the alginate in one go until no lumps are left. If a few lumps are left do not worry. Do not continue mixing too long otherwise the alginate will start to harden! After mixing, push the desired part of the body with the correct position in the mixture. We recommend using a position that entraps as little air as possible. Try to release as many air bubbles attached to the skin as possible by moving the body part or rubbing along the skin. After this try to move as little as possible and make sure you do not touch the edges of the mixing bowl. Wait until it has cured completely within +/- 5 minutes. The mold is now ready and can be filled with plaster, concrete, wax or many other casting compounds. The mold can be used once, and has a life span of a number of hours. Accelerator: The processing time will be much shorter if you use (luke-) warm or hot water! Retarder: The processing time can be increased by using cold water without minerals and salt (demineralised water). For belly castings, hand wreath or face castings use the ratio water:Alginate = 3:1. Press cottons into the freshly applied still slightly fluid alginate. This will facilitate the fixing of the alginate to the support hull made out of plaster bandage later on. PLEASE NOTE: Some hand poses are not suitable for alginate castings. This is because when fingers are bend too much, air cannot escape when plaster or other resins are cast into the alginate mold. This will cause fingertips to be warped or fail completely. Make sure air can always go up (tilted). If a finger is bend too much, this is not possible. 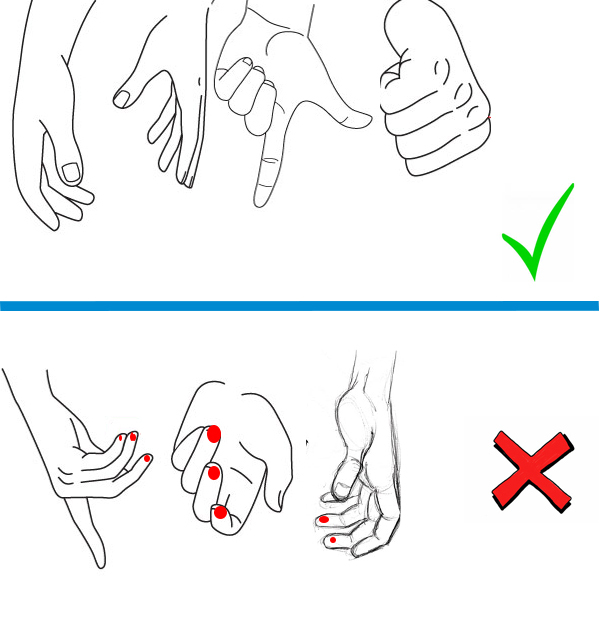 To still be able to use bend fingers, please make sure the fingertip touches the palm of your hand or any other part through which the air is able to move upward when you are pouring in plaster. The bend fingers in the wrong examples do not touch any part of the hand that enables air to travel upwards. This will cause air inclusions (marked with red dots) where plaster will not fill the finger tips completely. The 3-D Gel is delivered in a vacuum sealed package of 1 kg. Provided that the 3-D Gel is kept in a sealed container in a cool and dry area, the shelf life is 1-2 years. After opening and sufficiently sealing the shelf life will be about 6 months. To our knowledge, the 3-D gel completely harmless to humans and the environment. For more information, see the medical data sheet.